"Animals generally return the love you lavish on them by a swift bite in passing — not unlike friends and wives." Let's state as fact that, without exception, all monkeys bite. Big monkeys bite harder than small ones, but little bites can still be very serious. Getting the occasional bite is part of being a monkey parent but when it's a sign of aggression, it's important to know how to react decisively and quickly without giving your "child" the slightest hint of fear or timidity on your part. One thing to keep in mind, however, is that discipline overdo is just as bad as allowing them to get the upper hand. Every monkey has different types of bites and sometimes we have to allow them to be monkeys. I have the philosophy that "intent is everything". If I get a little too hard a nip during play, it requires just a light scolding, it doesn't ruin our day and we play on. If I get even the tiniest nip because he's mad... I come down hard and fast. It's not the bite that's the issue here so much as the disrespect shown to me as the alpha. I think it's important to know when to discipline and when to let it slide. Too much control makes a monkey apprehensive and fearful, and that can lead to aggression in it's own right. We have to let them be monkeys. Remember that monkeys bite for many reasons. To them it's a way of "tasting" and experiencing their environment and for every breed it's a component in playing. Here is a definition of different levels of biting exhibited primarily for smaller New World Monkeys. Exploratory bite: A nibbling or soft biting of an object as if to test what it is. Can I eat this? Can I play with it? Can I make use of it somehow? Young infants, in particular, will do this to finger-tips and any soft objects they come in contact with to satisfy their endless curiosity. They also do it more when they are teething, much like a human infant. Discipline mildly only if it becomes aggressive or uncomfortable. They must be allowed to be monkeys and explore an unknown world with all the senses and resources they have. Play bite: You must allow him to play bite . NHP's nibble and bite one another in play much as puppies or kittens do. This sort of activity is harmless and non-aggressive in intent and should not be punished unless it becomes painful or overly aggressive in nature. The monkey knows what is acceptable play biting and may at times just need a mild, but firm reminder to not get carried away. As with all discipline, the key here is consistency. Do not allow a hard bite one time and then get upset over it the next. This on-again/off-again response will confuse your monkey and lead to suspicion and mistrust. Decide what is or is not acceptable and then act accordingly. Your responses should be swift and totally predictable. Snap bite: A quick deep bite, followed by retreat: A snap bite from an angry marmoset will be obvious. It will definitely HURT and it will more than likely draw blood. It is also unacceptable at any time for any reason. A snap bite is can be the first level of intentional bite and is a sign of escalating aggression and desire for dominance. Repeat Snap Bite: This is a series of snap bits to the same area intended to cause damage and is a more aggressive form of snap bite.There is no retreat following the initial attack and is therefore a more serious sign of aggression. Totally unacceptable! Quick discipline and cage time out for a period of time. Uninhibited bite: this is the most extreme and aggressive bite, generally preceded by a low chattering sound and consists of a deep intentionally severe bite and a clamping of the jaw (much like that of a pit bull). An uninhibited bite from a marmoset will result in broken and torn skin and can be quite serious, to the extent of needing stitches to close. If given to the face, ears or nose (their chosen areas for this attack) it can result in permanent scarring. An enraged marmoset or tamarin is not to be taken lightly and will require caution in handling. If your monkey has escalated to this level of aggressive biting, there are steps that can be taken to regain control, but it will take time and a lot of stamina on your part. I will take this issue up in greater detail under a different topic. 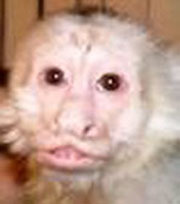 This monkey has sagging lips and deformed jaw from having a full mouth tooth extraction. I'm sure the owner would tell you how much this monkey is loved. So I ask, "Does this look like the face of a happy creature?" Subjecting any non-human primate to tooth extraction to prevent biting should never be an option. It is simply wrong to deform an animal for convenience, If this is the only way you can protect yourself from harm, I suggest you get a pet more in line with your parenting skills. "Pullling of healthy teeth to prevent a non-human primate from biting is unethical and should not be considered appropriate for the health and well-being of the non-human primate"